Elastic adjustable straps, elasticated waist, knee pad pockets. These trousers come with a high front and back to provide extra warmth around the body. The heavy-duty buckles with wide elastic suspenders are height adjustable to ensure a comfortable fit for the wearer. 5cm reflective tape around the leg increases wearer visibility and safety. Knee patches are reinforced for increased durability. Oversized pockets allow for access without removing gloves. 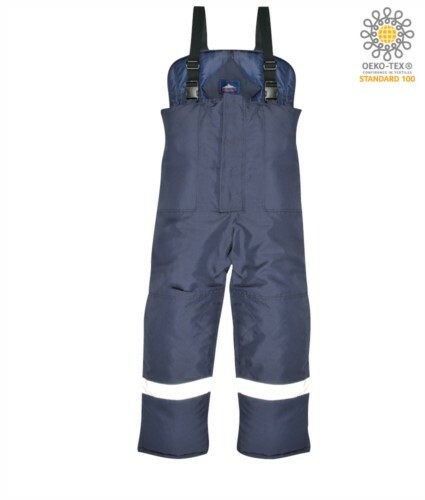 Dear friend, I suggest you this article: FREEZER TROUSERS ; You can find it on the web at: https://www.castbolzonella.it/scheda.asp?content=.